Who Is the Woman of Revelation? 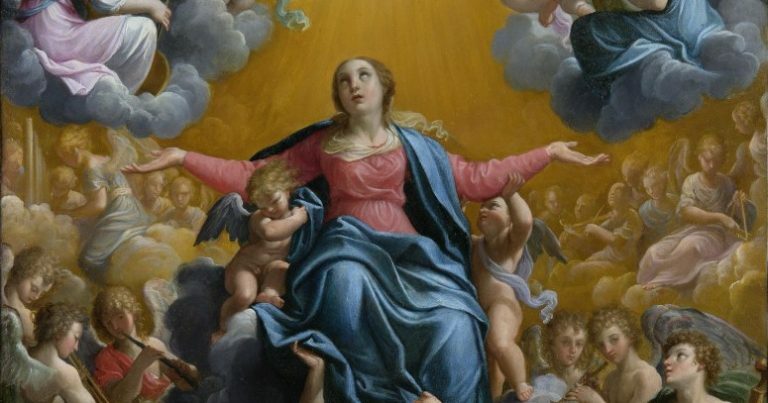 The dogma of the Assumption teaches that at the end of her time on earth, Mary was taken up—body and soul—into heaven. There, she sits at her Son’s right hand, as Queen of Heaven and Earth. The foundation for the teaching is rooted in Scripture, specifically in John’s mysterious and apocalyptic vision recorded in Revelation 12. First and foremost, the woman of Revelation 12 is identified as Mary, the one “who brought forth a male child, one who is to rule all the nations with a rod of iron . . . [the one] caught up to God and his throne” (Rev 12:5). Revelation 12, however, also uses imagery that reveals the woman to be Daughter Zion, the Queen-Bride of Israel, and the Mother of the Church. In likening the woman to the Queen Bride of Israel, his description of her echoes Isaiah, who said that Israel would be arrayed like a radiant Queen Bride (Is 60:19–20, 62:3–5). Solomon’s bride in the Song of Solomon is similarly described (Songs 6:10). John drives this point home by telling us that the woman wears a crown of twelve stars, an obvious symbol of the twelve tribes of Israel. But, throughout Revelation, the twelve tribes are also reckoned as signs of the twelve Apostles, the representatives of the new Israel, the Church (Rev 7:4–8, 21:12–14). So, just as Daughter Zion was a symbol of the chosen people of God—Israel—the woman in Revelation is also a symbol of the new people of God, the Church. Paul, in language similar to that of Revelation, called the Church “the Jerusalem above . . . our mother.” He also spoke of the Church as the Bride of Christ (Gal 4:26; Eph 5:31–32). Likewise, John referred to the Church as a “Lady” (2 Jn, v. 5). The woman of Revelation, however, is more than a symbol for the Church. She is also its mother with “offspring” in addition to the one male child to whom she gives birth. And those children are described in Revelation as those who believe in Jesus. In Revelation 12 we see a great battle which is a dramatic portrayal of the fulfillment of God’s promise in the Garden of Eden. The serpent lies in wait beneath the woman, preparing to devour her off spring. The birth of her son becomes the occasion for mortal combat. During the battle, the woman flees into the desert—to a place especially prepared for her by God. Later, after the devil’s defeat, John sees the woman given eagle’s wings to fly to a place in the desert where she would be nourished by God. John’s language recalls Jesus’ words to his Apostles in John 14:1–3. The language of preparing a place is also often used in the New Testament to describe the destiny God has planned for his children (Mt 20:23, 25:34; 1 Pet 1:5; 1 Cor 2:9). John’s words also evoke God’s care for Israel in the wilderness (Ex 19:4; Deut 1:31–33, 32:10–12, 8:2–3). The picture Revelation paints serves as the biblical outline for the Church’s dogma of Mary’s Assumption. Mary is Daughter Zion, the woman who gave birth to the world’s Savior. Because she is the New Eve, she is free from the shadow of sin and its consequences. This includes the long-term separation of soul and body that exists for the rest of us as we wait for the resurrection of the body at the end of time. Mary has been taken up into heaven by God to join her Son in the place He prepared for her. And in that place, as Christ the King’s mother, she sits at His right hand, wearing the crown of the Queen Mother. Additional scriptural evidence for Mary’s Assumption lies in the fact that there are at least two foreshadowings of it in the Old Testament as seen with Enoch and Elijah. This post is an excerpt from the Participant Workbook of The Bible and the Virgin Mary. The Assumption is one of the many doctrines and devotions illuminated in this award-winning series. Unpack the wealth of knowledge in The Bible and the Virgin Mary with both the DVDs and workbooks.